Commander William Lewis Herndon (25 October 1813 – 12 September 1857) was one of the United States Navy's outstanding explorers and seamen. In 1851 he led a United States expedition to the Valley of the Amazon, and prepared a report published in 1854 and distributed widely as Exploration of the Valley of the Amazon. He was noted especially for ensuring the rescue of 152 women and children when commanding the commercial mail steamer Central America in September 1857. During a three-day hurricane off the coast of North Carolina, the ship lost power. Herndon arranged for getting some women and children safely off the ship to another vessel. With no way to save the ship, Herndon chose to stay with more than 400 passengers and crew who drowned as the ship sank off Cape Hatteras on September 12. It was the largest loss of life in a commercial ship disaster in United States history. 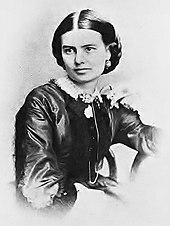 Ellen Herndon Arthur in 1859. Two years later his daughter Ellen Lewis Herndon married Chester A. Arthur, the future U.S. President. William Lewis Herndon was born in Fredericksburg, Virginia. He married Frances Elizabeth Hansborough and they had a daughter, Ellen Lewis Herndon, born in Culpeper Court House, Virginia. His great-niece was the novelist Lucy Herndon Crockett. Herndon was appointed midshipman on 1 November 1828. He was promoted to passed midshipman in 1834 and lieutenant in 1841. He cruised in Pacific, South American, Mediterranean, and Gulf waters from then until 1842. From 1842 to 1846, Herndon served in the Depot of Charts and Instruments of the US Naval Observatory with his first cousin and brother-in-law, Matthew Fontaine Maury. They prepared oceanographic charts and performed other scientific work invaluable to the safe and accurate navigation of the seas. During the Mexican–American War, Herndon commanded the brig Iris with distinction. In 1851 Herndon headed an expedition exploring the Valley of the Amazon, a vast area uncharted by Europeans, although inhabited for thousands of years by numerous tribes of indigenous peoples. The purpose of the expedition was to ascertain the commercial resources and potential of the valley. Departing Lima, Peru, 21 May 1851, Herndon, in the company of Lieutenant Lardner Gibbon and five other men, pressed into the jungles. After crossing the Cordilleras, Gibbon separated to explore the Bolivian tributaries of the Amazon while Herndon continued to explore the main trunk. After a journey of 4,366 miles, which took him through the wilderness from sea level to heights of 16,199 feet, Herndon reached the city of Pará, Brazil on 11 April 1852. On 26 January 1853, Herndon submitted an encyclopedic and illustrated 414-page report to the Secretary of the Navy John P. Kennedy. The report was published by the Navy in 1854 as Exploration of the Valley of the Amazon. The Navy ordered "10,000 additional copies be printed for the use of the Senate." It was circulated extensively, and cited in works on ethnology and natural history. Herndon was carrying perhaps 15 tons of gold (then worth $2,000,000) and 474 passengers, many of whom were from California and were returning to the East Coast, as well as 101 crew members. A few days after leaving Cuba on 7 September 1857, the ship encountered a three-day hurricane off Cape Hatteras. The hurricane steadily increased in force. By the 12th, the Central America was shipping water through several leaks due to the ship's lack of water-tight bulkheads and general unseaworthiness. Water in her hold put out her boiler fires, eliminating steam for propulsion pumps. Herndon recognized that his ship was doomed; he flew its flag upside down as a distress signal in hopes another ship would see them. At 2 p.m., the West Indian brig Marine arrived to help take passengers from the stricken steamer. It did not have room to take on all of the passengers and crew. Commander Herndon supervised the difficult loading of women and children into lifeboats to transfer to the Marine. He gave one of the women passengers his watch to send to his wife, saying that he could not leave the ship while there was a soul on board. Most of the women and children reached safety on the Marine. Herndon's concern for his passengers and crew helped save 152 of the 575 people on board. Men on the Central America tried to break up wooden parts to use as floats, in hopes of surviving the sinking. Some were rescued later by passing vessels, but most of the 423 persons on board died in what was the largest loss of life for a commercial ship in United States history. Survivors of the disaster reported last seeing Commander Herndon in full uniform, standing by the wheelhouse with his hand on the rail, hat off and in his hand, with his head bowed in prayer as the ship gave a lurch and went down. The ship disaster and loss of so much gold, which banks still depended on, contributed to the financial Panic of 1857 in the United States. The wreckage of the ship was discovered in a 1987 treasure recovery expedition. His brother officers erected Herndon Monument in his honor at the U.S. Naval Academy. The Navy has named two ships USS Herndon in his honor. The towns of Herndon, Virginia, and Herndon, Pennsylvania, are also named for him. ^ a b Reeves, Thomas C. (1975). Gentleman Boss. NY, NY: Alfred A. Knopf. p. 20. ISBN 0-394-46095-2. ^ a b c d e f g Wilson, J. G.; Fiske, J., eds. (1900). "Herndon, William Lewis" . Appletons' Cyclopædia of American Biography. New York: D. Appleton. Wikimedia Commons has media related to William Lewis Herndon. Kinder, Gary, Ship of Gold in the Deep Blue Sea, Boston: Atlantic Monthly, Inc. 1998. Herndon, William Lewis; Gibbon, Lardner (1854). "Exploration of the Valley of the Amazon". Department of the Navy. Matthew Fontaine Maury was an American astronomer, United States Navy officer, historian, oceanographer, meteorologist, cartographer, author, geologist, and educator. Ellen Lewis "Nell" Herndon Arthur was the wife of the 21st President of the United States, Chester A. Arthur. She died of pneumonia in January 1880; her husband was elected vice-president that November. He succeeded to the presidency in September 1881 when President James Garfield was assassinated. The first USS Bainbridge was a brig in the United States Navy during the American Civil War. She was named for William Bainbridge. CSS Ellis was a gunboat in the Confederate States Navy and the United States Navy during the American Civil War. It was lost during a raid while under command of famed Navy officer Lieutenant William B. Cushing. The Herndon Monument on the grounds of the U.S. Naval Academy is a 21-foot-tall (6.4 m) grey granite obelisk. It was erected in memory of Captain William Lewis Herndon, who courageously decided to go down with his ship, SS Central America, and the men left aboard rather than save himself on September 12, 1857. All women and children and many of the men aboard were saved by a nearby ship during the storm. The Pacific Mail Steamship Company was founded April 18, 1848, as a joint stock company under the laws of the State of New York by a group of New York City merchants. Incorporators included William H. Aspinwall, Edwin Bartlett, Henry Chauncey, Mr. Alsop, G.G. Howland and S.S. Howland. These merchants had acquired the right to transport mail under contract from the United States Government from the Isthmus of Panama to California awarded in 1847 to one Arnold Harris. USS Albany, the first United States Navy ship of that name, was built in the 1840s for the US Navy. The ship was among the last of the wooden sloops powered by sail and saw extensive service in the Mexican War. Before and after her combat service, Albany conducted surveillance and observation missions throughout the Caribbean. In September 1854, during a journey along the coast of Venezuela, Albany was lost with all hands on 28 or 29 September 1854. Included among the 250 men lost were several sons and grandsons of politically prominent men. USS Galena, was a wooden steamer built at the Norfolk Navy Yard in 1879 and commissioned there August 26, 1880, with Commander James O'Kane in command. Galena was the second ship of the United States Navy to bear that name.